Reader experience: What’s cool in Paris? There are way too many cool places (here and overseas) that shouldn’t be overlooked, so it thrills me when someone’s willing to document such a destination. Here I present artist extraordinaire Laura Sanda, who experienced one of three up and coming neighborhoods in Paris featured in Budget Travel’s Nouveau Paris. “I have a firm belief that the Metro map is tattooed somewhere in my brain, for while I cannot tell you what side my gas tank is on, I can tell you exactly how to get across town in any direction in Paris. Rue de Montorgueil (Montorgueil’s neighborhood center) consists of one main street. The location is also strategic in that Montorgueil is crowned by the public treasury building and a large corporate bank, which, by their size and the people coming in and out of the doors, employs a large number of Gen Xers and Yers. The nearby underground mall/train station brings traffic there as well. The street’s cobblestones have been exposed and the asphalt sidewalks replaced with granite. Autos are forbidden, but a few cards and motorbikes managed to find a way down. A brasserie (cafe serving alcohol) at the end of the street across from the park was full of Gen Xers and Yers watching the crowds mill by. The absence of a nightclub limits nightlife to the cafes, which do well, but do not have the air that encourages lingering for an evening. 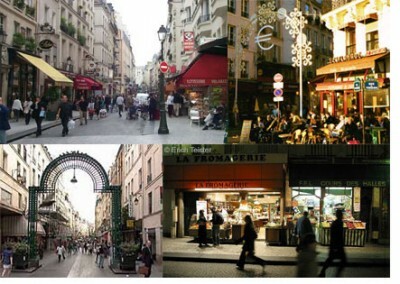 The large number of boulangeries (bakeries) and pastry shops, which close about 4, also means a large part of the street closes at night.